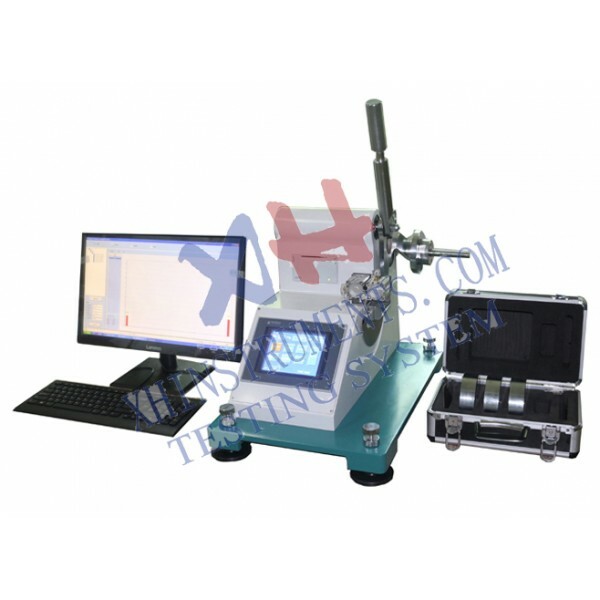 Digital Fabric Textile Elmendorf Tear Tester, A computer controlled falling-pendulum instrument, to determine the ballistic tearing strength of textiles, plastics, paper or board﻿. Standard: BS 4253, ASTM D1424 , Din 53862 BS EN ISO 13937, ISO1974/9290. The test is carried out on a specimen composed of one or more sheets of standard dimensions 100 x 63 mm, a crack in length of 20 mm of specimen is notched automatically, a usually with a distance of 43mm (1.7 in) remaining to be torn after initiating the tear. The energy of a pendulum of suitable weight is used to completely tear the specimen. The difference in the angle from the vertical of the center of gravity of the pendulum between the downswing and upswing is a measure of the energy absorbed in tearing the sample. This angular movement is measured with a digital encoder and is immediately converted to the mean tearing force for a single sheet by the microprocessor and software incorporated in the apparatus. Works in accordance with all known test standards. Repeatable, pneumatic specimen gripping system guarantees sufficient clamping pressure to avoid all slipping phenomena, thus ensuring perfect reproducibility of the experimental conditions. Automatic compensation for friction and leveling errors, no slave pointer, therefore no friction, alignment and maintenance problems. Unit: N, gf, cN, Cp can be selected.